Hello, I'm in France and I need the following items: 1. Toner (Black, yellow, cyan, magenta) 2. Drum for black and colour 3. IBT belt 4. Fuser Can you send me the cost of each item and the lump sum figure? How much would it cost to transport all of them to Uganda, East Africa because I'm actually buying them for my brother who's back home? Walter Yondi. Sorry, Cartridge Save is a UK based online retailer and we're unable to deliver Xerox DocuColor 242 printer supplies to countries outside of the UK. Provided that you've purchased with Cartridge Save previously then you'll probably understand that we are competitive on the price of Xerox 242 toner cartridges. This cheap Xerox DocuColor 242 toner cartridge is covered by our own low cost policy so that the price you see is the price you'll pay!We pride ourselves on supplying fine quality toner cartridges for the Xerox DocuColor 242 laser printer that are rigorously put through their paces by experts to ensure solid performance. For added reassurance, we offer a complete, cash back guarantee on your Xerox DocuColor 242 toner so that you'll not ever need to settle for a poorly performing cartridge. Saving cash is effortless when you order with us because we provide free delivery for Xerox DocuColor 242 toner. Making our customers satisfied is our main concern, a fact underlined by the offer of our cast iron guarantee on Xerox DocuColor 242 toner cartridges. Our customer service team will be more than happy to take care of your purchase all of the way. Get your order in now and start saving . The Xerox DocuColor 242 is a production grade printer, copier, and scanner that allows quick operation, rated at 40 to 60 ppm when processing colour and up to 55 to 75 ppm when printing or copying black and white documents. It is a popular choice among growing offices, offering a standard input capacity of up to 3,260 sheets, which can be expanded to 5,260 sheets. 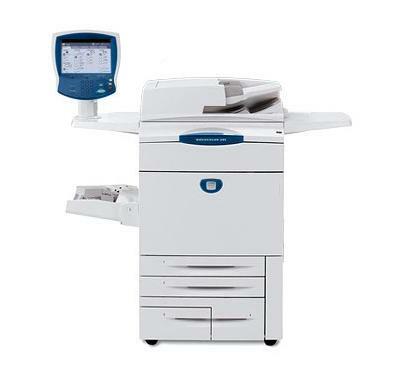 The Xerox DocuColor 242 colour laser MFP even has a number of finisher options and it can be used with many different operating systems from both Windows and Mac. However, the Xerox 242 multifunction colour printer lacks fax applications and its optional features pull the upfront and maintenance costs up. The Xerox DocuColor 242 colour laser printer is relatively compact, measuring only 65.1x36.2x54 inches. It has different controller options for convenient setup, and its digital scanner can produce high resolutions up to 600x600 dpi. The Xerox DocuColor 242 printer has a large capacity automatic document feeder, which is also capable of automatic duplexing, and its standard input capacity can be maximised to more than 5,000 sheets. The Xerox DocuColor 242 colour printer is a good choice for busy offices in need of a compact all-in-one to do all their document production tasks. However, the Xerox 242 MFP lacks fax capabilities and is slightly expensive, especially with all the additional features.